The Workbook class is the main class exposed by the XlsxWriter module and it is the only class that you will need to instantiate directly. The Workbook class represents the entire spreadsheet as you see it in Excel and internally it represents the Excel file as it is written on disk. Create a new XlsxWriter Workbook object. filename (string) – The name of the new Excel file to create. options (dict) – Optional workbook parameters. See below. Note, in this mode a row of data is written and then discarded when a cell in a new row is added via one of the worksheet write_() methods. Therefore, once this mode is active, data should be written in sequential row order. For this reason the add_table() and merge_range() Worksheet methods don’t work in this mode. The temporary directory must exist and will not be created. This option overrides the constant_memory option. See also Timezone Handling in XlsxWriter. To avoid the use of any temporary files and keep the entire file in-memory use the in_memory constructor option shown above. See also Example: Simple HTTP Server (Python 2) and Example: Simple HTTP Server (Python 3). Add a new worksheet to a workbook. name (string) – Optional worksheet name, defaults to Sheet1, etc. DuplicateWorksheetName – if a duplicate worksheet name is used. InvalidWorksheetName – if an invalid worksheet names is used. The add_worksheet() method adds a new worksheet to a workbook. At least one worksheet should be added to a new workbook. The Worksheet object is used to write data and configure a worksheet in the workbook. 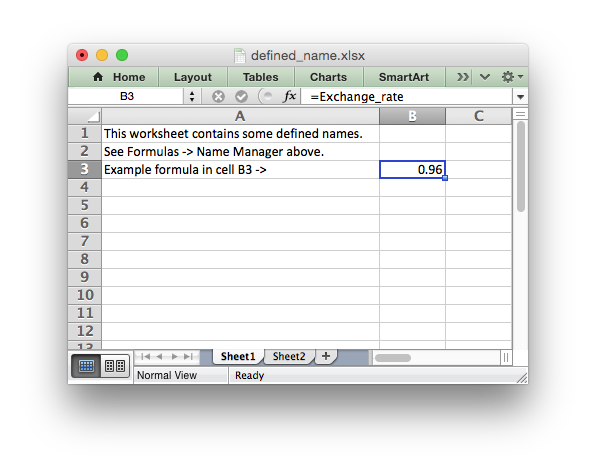 The worksheet name must be a valid Excel worksheet name, i.e. it cannot contain any of the characters [ ] : * ? / \ and it must be less than 32 characters. These errors will raise a InvalidWorksheetName exception. In addition, you cannot use the same, case insensitive, name for more than one worksheet. This error will raise a DuplicateWorksheetName exception. Create a new Format object to formats cells in worksheets. properties (dictionary) – An optional dictionary of format properties. 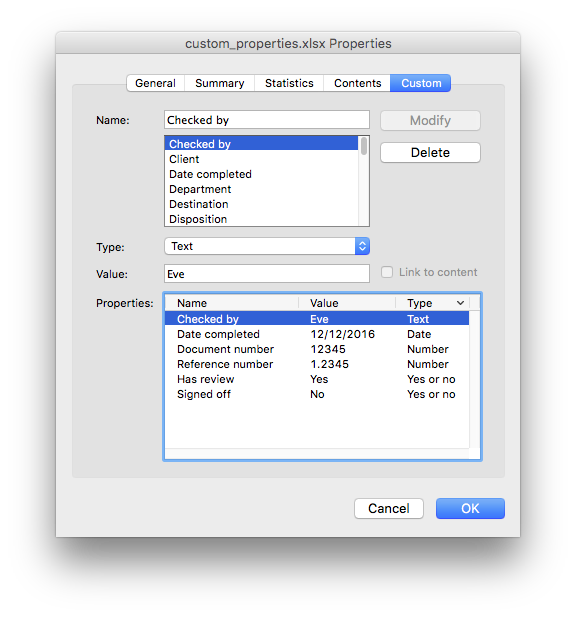 format1 = workbook.add_format(props)  # Set properties at creation. format2 = workbook.add_format()       # Set properties later. See the The Format Class section for more details about Format properties and how to set them. Create a chart object that can be added to a worksheet. options (dictionary) – An dictionary of chart type options. See the The Chart Class for a list of available chart subtypes. A chart can only be inserted into a worksheet once. 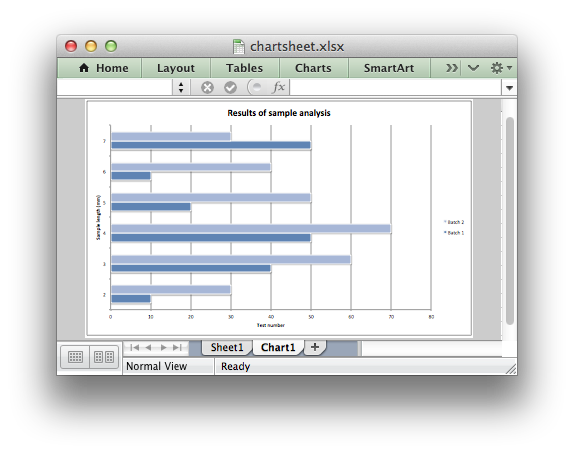 If several similar charts are required then each one must be created separately with add_chart(). See also Working with Charts and Chart Examples. Add a new add_chartsheet to a workbook. sheetname (string) – Optional chartsheet name, defaults to Chart1, etc. The add_chartsheet() method adds a new chartsheet to a workbook. See The Chartsheet Class for details. The sheetname parameter is optional. If it is not specified the default Excel convention will be followed, i.e. Chart1, Chart2, etc. The chartsheet name must be a valid Excel worksheet name, i.e. it cannot contain any of the characters [ ] : * ? / \ and it must be less than 32 characters. In addition, you cannot use the same, case insensitive, sheetname for more than one chartsheet. Close the Workbook object and write the XLSX file. DuplicateTableName – if a duplicate worksheet table name was added. EmptyChartSeries – if a chart is added without a data series. UndefinedImageSize – if an image doesn’t contain height/width data. UnsupportedImageFormat – if an image type isn’t supported. IOError – if there is a file or permissions error during writing. This is a required method call to close and write the xlsxwriter file, unless you are using the with context manager, see below. The workbook will close automatically when exiting the scope of the with statement. Set the size of a workbook window. width (int) – Width of the window in pixels. height (int) – Height of the window in pixels. The Excel window size was used in Excel 2007 to define the width and height of a workbook window within the Multiple Document Interface (MDI). 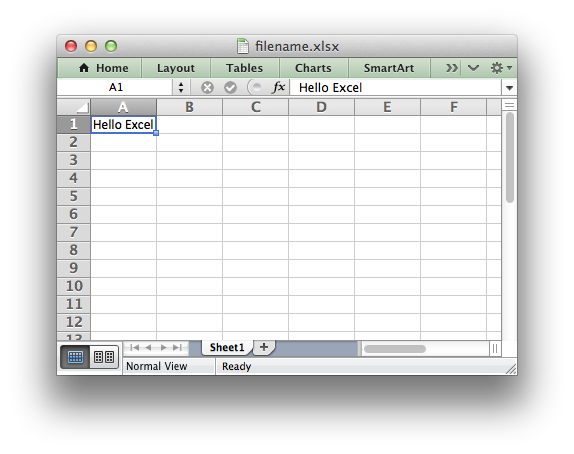 In later versions of Excel for Windows this interface was dropped. 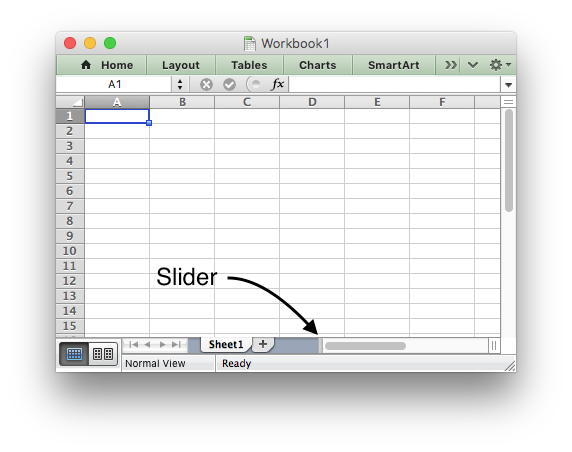 This method is currently only useful when setting the window size in Excel for Mac 2011. The units are pixels and the default size is 1073 x 644. Note, this doesn’t equate exactly to the Excel for Mac pixel size since it is based on the original Excel 2007 for Windows sizing. Some trial and error may be required to get an exact size. Set the ratio between the worksheet tabs and the horizontal slider. tab_ratio (float) – The tab ratio between 0 and 100.
properties (dict) – Dictionary of document properties. The set_properties() method can be used to set the document properties of the Excel file created by XlsxWriter. These properties are visible when you use the Office Button -> Prepare -> Properties option in Excel and are also available to external applications that read or index windows files. create - the file creation date as a datetime.date object. 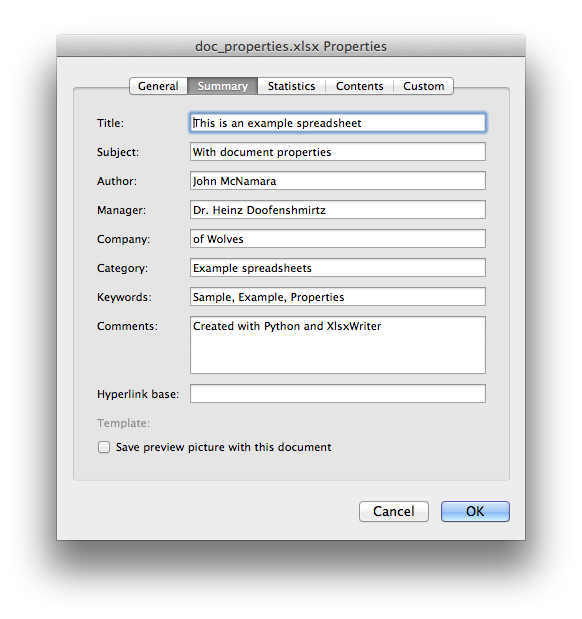 See also Example: Setting Document Properties. Set a custom document property. name (string) – The name of the custom property. value – The value of the custom property (various types). property_type (string) – The type of the property. Optional. The set_custom_property() method can be used to set one or more custom document properties not covered by the standard properties in the set_properties() method above. Date parameters should be datetime.datetime objects. However, in almost all cases the type will be inferred correctly from the Python type, like in the example above. Create a defined name in the workbook to use as a variable. name (string) – The defined name. formula (string) – The cell or range that the defined name refers to. This method is used to defined a name that can be used to represent a value, a single cell or a range of cells in a workbook. These are sometimes referred to as a “Named Range”. Add a vbaProject binary to the Excel workbook. vba_project – The vbaProject binary file name. is_stream (bool) – The vba_project is an in memory byte stream. Only one vbaProject.bin file can be added per workbook. The is_stream parameter is used to indicate that vba_project refers to a BytesIO byte stream rather than a physical file. This can be used when working with the workbook in_memory mode. See Working with VBA Macros for more details. Set the VBA name for the workbook. name (string) – The VBA name for the workbook. The set_vba_name() method can be used to set the VBA codename for the workbook. This is sometimes required when a vbaProject macro included via add_vba_project() refers to the workbook. The default Excel VBA name of ThisWorkbook is used if a user defined name isn’t specified. Return a list of the worksheet objects in the workbook. A list of worksheet objects. Return a worksheet object in the workbook using the sheetname. name (string) – Name of worksheet that you wish to retrieve. Set the Excel calculation mode for the workbook. Set the calculation mode for formulas in the workbook. This is mainly of use for workbooks with slow formulas where you want to allow the user to calculate them manually. auto: The default. Excel will re-calculate formulas when a formula or a value affecting the formula changes. manual: Only re-calculate formulas when the user requires it. Generally by pressing F9. auto_except_tables: Excel will automatically re-calculate formulas except for tables. Allow ZIP64 extensions when writing xlsx file zip container. Use ZIP64 extensions when writing the xlsx file zip container to allow files greater than 4 GB.